Selecting a fruit tree takes a little planning and research, but the reward of enjoying a healthy and productive tree for many years is definitely worth the effort. Here are the questions you'll need to answer before making your final selection. 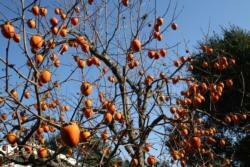 Persimmon trees provide shade in summer and color in winter. 1. What is your microclimate? Deciduous fruit trees require a certain cumulative number of hours at or below 45 degrees Farenheit every winter to end their dormancy and then flower and bear fruit. This is known as “chilling requirement.” Most areas of Marin receive around 800 to 1,000 hours of chill every winter, which is enough for most fruit trees, but this will vary from microclimate to microclimate. Areas with significant marine influence will receive the least chill; inland areas will have the most. Luckily, for those in borderline areas there are many varieties of “low-chill” fruit trees on the market today. For more about chilling hours in Marin, visit http://fruitsandnuts.ucdavis.edu/chillcalc/index1.htm. Summer warmth is another part of your microclimate puzzle. Some fruits, such as peaches and nectarines, love a long, hot summer. Apples like warm days and cool nights (think Sebastopol). Apricots, cherries and pears will perform in somewhat cooler summer areas, but not right on the coast. Figs and persimmons aren’t too picky, but will be tastier with summer warmth. Sometimes an area has all the right winter and summer requirements but is plagued by late rains, wind or fog. This can hurt or knock off growing buds or inhibit pollination. Here again, “low-chill” varieties may be beneficial because their buds will be more developed and less likely to be affected by the elements. In general, the stone fruits (peaches, nectarines, apricots, cherries and plums) don’t respond well to extremely wet springs. Fruit trees appreciate full sun and fertile, well-drained soil. For gardeners with less than ideal soil conditions, the rootstock becomes an important decision point. The rootstock of a fruit tree consists of the roots and lower trunk onto which a scion is grafted. The scion contains the genetic material that guarantees that every ‘Fuji’ apple tree will bear the same type of fruit. It’s the part of the tree we see and enjoy. The rootstock is the underground workhorse. Most fruit trees are scions grafted onto rootstock selected for disease resistance, dwarfing and/or specific soil conditions such as heavy clay or sand. If slow-draining soil that cannot be amended is a concern, consider finding a rootstock that can handle it. 2. How much space do you have? Fruit trees are available in dwarf (8 to 10 feet), semi-dwarf (10 to 20 feet), and full size (20 feet and over). For harvesting, dwarfs and semi-dwarfs make a gardener’s life much easier. If shade and ornamental value are more important than space considerations, then perhaps a full-size specimen is the best choice. Space is an important consideration for fruit tree selection because there's a chance that you might need to buy two trees. That's because some fruit trees must cross-pollinate for fruit to develop. When cross-pollination is required, it is necessary to have a particular companion pollinating tree or shrub nearby. Many pear and cherry trees require that a particular variety of tree be nearby as a pollinator. For instance, ‘Bing’ cherries like having a ‘Black Tartarian’ cherry tree nearby for cross pollination, and ‘Bartlett’ pears often need a companion. Buying two trees instead of one can be impractical because space in Marin backyards is often at a premium. It’s best to choose self-fertile varieties whenever possible. Occasionally a neighbor will have an appropriate tree. As a rule of thumb, if you can see the potential pollinator from the site of your new tree, then it’s probably close enough for effective pollination to occur. 3. Will your tree be disease resistant? Marin’s climate is damp, and high humidity provides the perfect breeding ground for many pathogens. 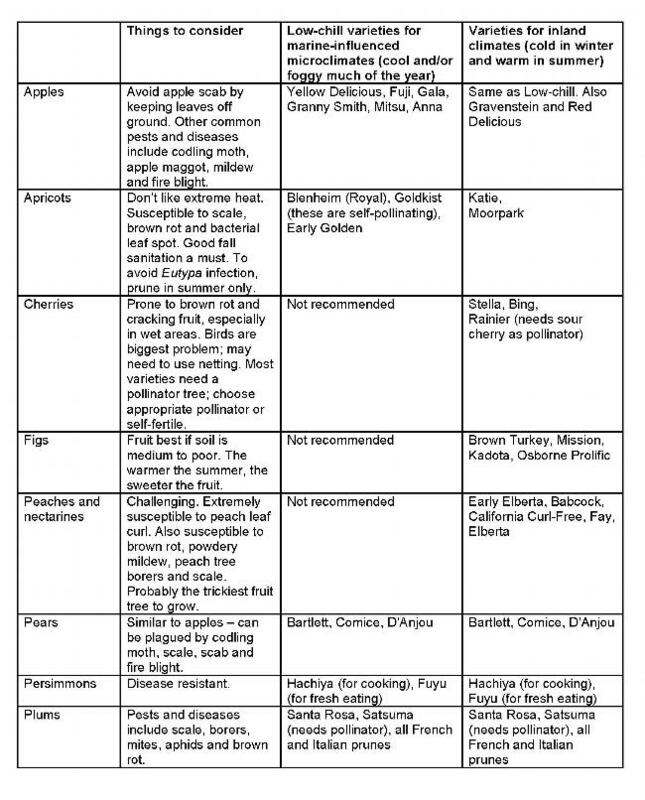 Refer to the chart below for potential problems, and choose varieties that are disease resistant. 4. Who will prune your tree? Be sure to find a reputable pruner. Pruners are sort of like a fruit tree’s dentist. This is because fruit trees require two checkups per year: one in winter to prune during dormancy, and one in summer to shape and trim. Adhering to this schedule assures that branches will not be snapping off under the weight of fruit. It also means that your tree will be attractive all year, whether you’re admiring its springtime blossoms, harvesting fruit in summer or enjoying its shade during Marin’s warm autumn months. 5. Where will you go for help? Fruit trees have specific maintenance requirements for pest and disease prevention and optimum fruit production. A good reference is the University of California's Fruit Trees: Planting and Care of Young Trees. The University of California has also published an excellent fruit tree book called The Home Orchard. Marin gardeners are invited to peruse this book at the Master Gardener Help Desk located at 1682 Novato Boulevard, Suite 150B, in Novato.